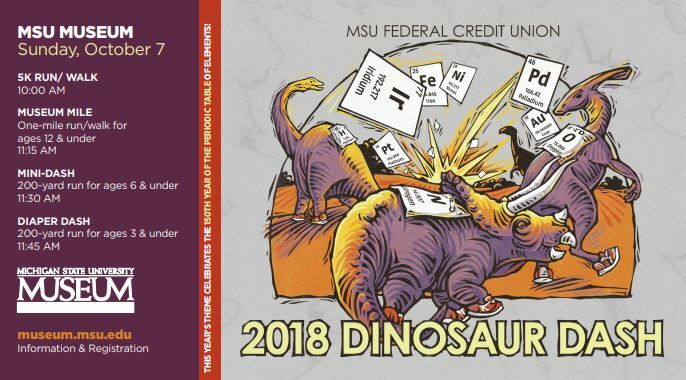 Mid-Michigan residents get ready for “Earth-shaking fun” at the 33st annual MSU Federal Credit Union Dinosaur Dash, a 5K run/walk, set for 10:00 a.m. on Sunday, Oct. 7, at the Michigan State University Museum. Meanwhile, the Museum Mile, Mini Dash and Diaper Dash make for dinosaur-size fun and fitness for the whole family. The event is a fall-time favorite – beginning with the fast, flat trek around campus, and then concluding with exhibits and activities inside the MSU Museum. 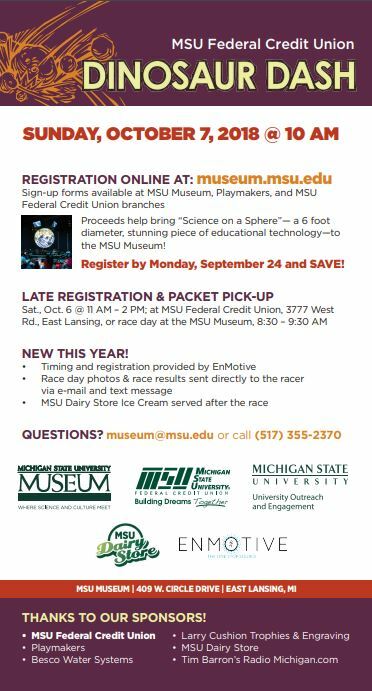 Proceeds from the MSU Federal Credit Union Dinosaur Dash will help bring “Science on a Sphere” – a 6 foot diameter, stunning piece of education technology – to the MSU Museum, MSU’s science and culture museum and the state’s first Smithsonian Institution affiliate. The event -- with an expected 2,500 runners -- walkers and families, draws more people to the MSU Museum than any other day of the year.